Looking for improved wear from your corrugated sleeves? 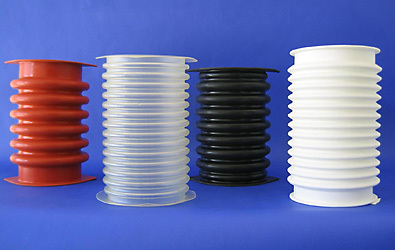 For all your vibratory and gyratory machine connections, you can depend on Siftex for the largest selection of molded corrugated sleeves. We stock the most diameters, lengths, styles and materials so it is easy to choose the right sleeve for your application. Is your product dry, wet, oily, sticky, abrasive, food grade, high temp or low? 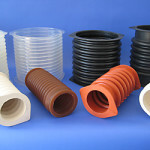 With 30 years in the flexible connector business, Siftex has learned why some sleeves succeed when others fail. Put our experience and selection to work saving you time and money. Corrugated sleeves are the traditional backbone of flexible connections. Siftex offers all three standard styles in a variety of lengths, diameters and compounds, including ultra-tough polyurethane… and we maintain a large inventory of the most common size and material versions for immediate shipment! Looking for improved wear from your corrugated sleeves? For all your vibratory and gyratory machine connections, depend on Siftex for the largest selection of molded corrugated sleeves, especially if you’re ready for improved design and longer-lasting materials. What is going through the sleeve? Is your product dry, wet, oily, sticky, abrasive, food grade, high temp or low? 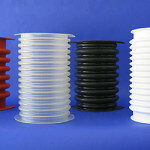 With over 25 years in the flexible connector business, Siftex has learned why some sleeves succeed when others fail. Depend on Siftex… whatever sleeve you need, Siftex provides the inventory and service to make sure you get it right and get it fast! Ready for improvement? If you’re tired of the limitations of molded corrugated sleeves, Siftex offers other flexible connector solutions that improve plant safety and sanitation while reducing maintenance time and costs. Browse our other product pages, or call your sales representative today to get better connected! For maximum flex life, choose the original Siftex design sleeve with more corrugations for improved wear and durability. Ideal for all types of vibratory and gyratory motion including screeners, sifters, dryers, conveyors, hoppers and more. 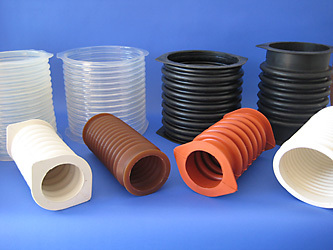 Siftex supplies molded corrugated sleeves in six different rubber compounds. Siftex maintains a large inventory of corrugated sleeves in all styles, sizes and compounds. Contact our sales department for quick pricing, selection and shipment! Because of their molded nature, corrugated sleeves do not lend themselves to easy custom sizes. If you need a connector for a special length, diameter or other characteristic, talk to our sales team today. If we can’t make or modify a molded corrugated connector for your application, we can almost certainly solve your problem with another of our more adaptable connection technologies. Capack (Pty) Ltd offers specialized solutions for industries handling difficult products which may compromise, health & safety, as well as hygiene.